The Cuisinart CTK-EOS17BK tea kettle has black enamel on steel which offers a unique style and color. The kettle heats up quickly and retains heat well. This Stainless kettle is available in 2-quart capacity. The Aura 2Qt Tea Kettle Black Enamel On Steel has many exciting features for users of all types. You can extend the lifetime of your Aura 2Qt Tea Kettle Black Enamel On Steel with the purchase of a FactoryOutletStore Factory Protection Plan. 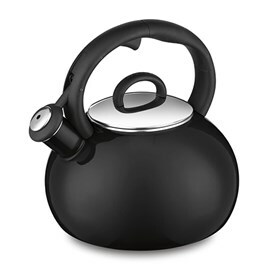 The Aura 2Qt Tea Kettle Black Enamel On Steel is sold as a Brand New Unopened Item.